Please vote in the latest poll. The context is a face off between the armed forces and unarmed citizens staging a political protest, as seen in Bahrain, Egypt, Libya and Yemen in recent weeks. If your officer orders you to shoot, would you do so? Many thanks. Political unrest in the Middle East is the closest thing to the Domino Effect coming true. 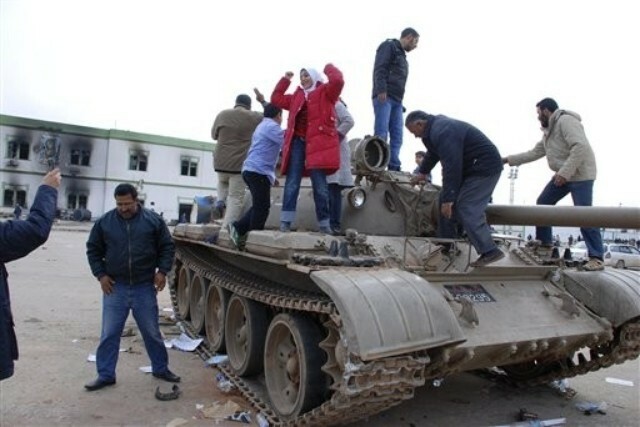 After leadership changes in Tunisia and Egypt, the spotlight is now on Libya with the country gripped by civil unrest. The kingdom of Bahrain also pops up in the media with its on again/off again political violence that pits Bahraini against Bahraini. In recent weeks, we have seen Egyptian security forces lack the will to shoot unarmed Egyptians. But their Libyan neighbours have hired guns to do the state's dirty work. African mercenaries are said to be prowling key cities with shoot-to-kill orders. Reports from Libya claim that the brutality of these hired guns has in turn prompted some Libyan soldiers to turn on the regime, fuelling a spiral of violence that is tearing the country apart. The role of mercenaries in keeping the peace by waging war on civilians appears to have bought the embattled Libyan regime some time. It may die soon, but there is little denying that mercenaries have put the regime on life support. It would appear that when ordered to open fire on civilians, thinking soldiers do reason that they are not paid or conscripted to shoot the very people they train to defend. The reluctance of citizen soldiers, who are mainly conscripts and reservists, to pull the trigger when ordered to do so will cast doubt on the role of the military during a national uprising. Mercenaries have no such moral dilemma. Mercenaries/hired guns/private military contractors are loyal to whoever signs their pay cheque. Many will have no compunction using deadly force against unarmed gatherings. This lack of moral compass and their dependable nature during times of strife will make mercenaries sought after as life insurance by regimes worldwide. To those familiar with Singapore's national security apparatus, the relevance of the points just raised will be obvious. But more on that in a bit. The security situation in Bahrain sends mixed signals to defence and security watchers around the globe. Authorities there are said to have unleased military and security forces to gun down Bahrainis. But the response from the United States, which has based its 5th Fleet in the Arab kingdom, has been limited to restrained tongue wagging. There was no Tiananmen redux after blood flowed in Bahrain. The muted response from Western leaders raises the poser whether a country can get away with shooting its own people so long as the bodycount does not hit a trigger point. And if so, despots would no doubt be keen to know that magic number. One imagines that if a country is a major destination for American weapons makers and a host to US military forces, then the government of the day can get away with murder political violence. This brings the discussion back to Singapore. The city state has enjoyed 45 years of peace, progress and prosperity - this after a tumultous start to nationhood which has been hailed as the Singapore story. In a worst-case scenario, a freak election result could boot out the government of the day. If Singaporeans unwittingly vote in a rogue government, a would-be despot would find that he (or she as the case may be, since there are many bad tempered and scheming Singaporean women out there) has at his/her disposal a host of instruments to muzzle dissent. In this nightmare future, the new government of the day would also find that Singapore's importance to the US military presence in the Pacific Rim is a useful trump card. As with the case of Bahrain, this trump card is likely to buy the Republic some breathing space should the rogue government find a need to beat down protestors. At present, the number of Nepali mercenaries in Singapore outnumbers that of the Singapore Armed Forces (SAF) units on standby as an Alert Red force. The Nepalis form the Gurkha Contingent - an innocuous sounding set up that counts a brigade strength unit of highly-trained police officers. The GC is equipped with wheeled armour and has its own special forces unit with all the bells and whistles one would expect a SF team to possess. The hard truth is that if a rogue government takes power some day, Singapore's citizens army will be powerless to stop an oppressive regime from clamping down on dissent using brute force. Unlike National Service armies in Israel, Sweden and Switzerland, Singaporean NSmen are not allowed to bring their personal fire arms home. This means that a rogue government has little to worry about should it want to impose harsh measures against Singaporeans. Placed in a similar conundrum as warfighters in the Middle East, SAF officers are unlikely to tolerate a situation should a rogue government order the GC to open fire on civilians. One can imagine a situation where SAF NSFs and NSmen deployed for "civil contingency operations" refuse to obey orders to open fire on unarmed protestors. Even if the SAF plans to mount a counter strike, the forces at the disposal of Singapore's military can be quickly neutered by the GC. The Gurkhas have superior numbers vis-a-vis SAF standby forces in peacetime and, more importantly, have access to intelligence that alerts the powers-that-be of murmurings of dissent. The value of intelligence in aiding the fight cannot be under-estimated. Astute information gatherers who can break into the SAF's decision making cycle can rein in the citizen's army before it mobilises for action. The LTIOV for internal security and civil contingency operations is short and the ability of Singapore's internal security apparatus to gather, process and act on time-sensitive intelligence makes it less likely the SAF can hatch a plot under the nose of a rogue government. Singaporeans who have seen Gurkhas on duty at events such as the Singapore Air Show, Shangri-La Dialogue and high profile international conferences held in Singapore (IMF World Bank Meeting, APEC) will probably agree they stand out as disciplined professionals. Off duty, those you bump into during runs at Mount Vernon or at the East Coast Park are as friendly as they come. But it is precisely this steel discipline, the fact that they are hard wired to follow orders without question, that worries me. If the men in white are one day replaced by men in black (i.e. rogue government) who have nefarious intentions, street protests of the kind we have seen in the Middle East are unlikely to result in a change of government. Indeed, civil disobedience in Singapore is likely to be brutally suppressed. I am unaware of any circuit breaker that could muzzle internal security forces such as the GC so long as Singapore's Prime Minister gets into his Parliament seat by the ballot box. The elected President might be the people's saviour. But remember that this office was designed more to safeguard the Lion City's massive financial reserves than to hold back the goon squad internal security elements. A People's President may hold another key to the reserves, but he cannot hold back internal security operations and may find himself besieged in the Istana, powerless to intervene. This nightmare scenario is unlikely to pan out anytime soon and is as likely to come true as the nightmare scenario of Malaysia invading Singapore. Still, the SAF trains hard to defend Singapore against a full threat spectrum. And defence aware Singaporean netizens should likewise be mindful of internal security scenarios that could trip up our fragile nation. I didn't know that the GC is actually so big. As an after-though, what is there to stop the GC from mounting a mutiny given that from what I gather they actually get quite a bad deal (e.g being shipped back to Nepal after their service with a small payout only). Published figure for GC strength is 1,500 officers according to Police Life. Assuming one battalion has around 500 men, that's the basis for me stating that the GC is brigade strength. If GC mounts a mutiny, the armed Gurkhas will be a huge internal security problem but cannot take over the country as Singaporeans will still be in charge of national institutions. Plus, they do not control the media so how to win hearts and minds? The Gurkhas also put their loved ones at risk if we retaliate by ordering the SAF to level Mount Vernon Complex. Good post. Much more realistic than Catherine Lim or even MM in taking as its point of departure that the SAF (or at least the NS elements of it) are the real guarantors of the will of the people. As for the scenario being put forward, Commander GC is a seconded British Army officer, so that creates some interesting complications. Also, I'd be wary of the gurkha stereotype of blind loyalty too, considering the lawsuits that have been filed against the UK government for pension benefits etc. I fail to see how the GC = guns-for-hire. If you look at their constitution and management, plus their history, they are not. If they were like Executive Outcomes, the GC would have been used in any number of conflicts around the world. Also, this nighmare scenario cannot happen overnight in Singapore. Unless a coup happens, which renders your scenario improbable because by definition, you need the military onboard for a coup to happen, no autocratic/strong-man dictatorship can establish itself overnight. And I believe Singaporeans are not dumb. Any party with such inclinations will not be allowed to move in that direction. You may argue that the PAP is autocratic, but for your scenario to work, we're talking about a different league of autocracy altogether! This generally involves the formation and existance of an "elite" group of individuals of society. In such setups around the world, that elite group is sectarian, or is a function of a monarchy, both conditions do not, and will not, exist in Singapore. So unless a secret cult or special brotherhood is established now to work towards that end in the distant future, I'll sleep at night knowing this nighmare will not come true. My nighmare scenario is the opposition party is voted in only to realise running a globalised, small country with a very demanding population isn't as easy as they thought they be, and they find themselves intellectually and/or structurally ill-equipped for the challenge. So military action like this doesn't scare me. Just bad public policy! Re: GC's having a bad deal, they do not. In fact, being in the GC is still a highly sought after job in Nepal, with only a fraction of those who seek employment actually chosen. The "pay-off" may be small by the standards of developed countries, but it's sufficient for retiring GC members to have a comfortable 2nd career in Nepal. It usually involves buying a plot of land. The main unhappiness stems from some members feeling they are working as first-world professionals but paid (salary, benefits, pensions etc) by third-well standards. This is an issue all migrant workers are concerned with. If the leadership can somehow mentally dehumanize the enemy sufficiently, and make their subordinates think that way, we're one step towards such a tragedy. Add deindividualization of the troops ("I was just following orders") either by means of punishment, respect or reward, and the stage is set for another massacre. re: "You may argue that the PAP is autocratic, but for your scenario to work, we're talking about a different league of autocracy altogether!" Would you be so kind as to point out which part of the post states or implies that the PAP is autocratic please? I'm keen to know because if it strikes you as such, I'll have to tweak the way I write. In Egypt, the ex-regime found that their soldiers are unreliable when deployed for internal security duties. In Libya, the authorities there have apparently used African mercenaries because these paid fighters do as they are told. In Singapore, we also have paid fighters and these are the Gurkhas. Some of you may disagree the GC are mercenaries because of their historical role etc. Foreign journalists do not care for such subtleties and will probably describe them as such. This is a point we have to be mindful of. The Brits faced the same issue during the Falklands when trying to describe the role of the Gurkhas in the British Army. The GC's role and the curious immunity status for Bahraini rulers have given rise to the points raised in this post. re: Scenario is unlikely. Please come back tomorrow evening. I have a picture to share with all of you. I thank you all for your comments. Whatever your point of view, they do contribute to the discussion. Thank you for taking the time to write and enjoy the rest of your weekend. WHY DOES SINGAPORE NEED A MERCENARY FORCE? Don't we have the best equipment and trained SAF, which has many billion bucks in defence budget annually, the highest in S.E.A. i believe. A mercenary force is more willing to shoot un-armed Singaporean civilians than the SAF or Police, i guess. Thus the need to have a mercenary force, i.e. the GC in Singapore. My nighmare scenario is ______ realise running a globalised, small country with a very demanding population isn't as easy as they thought they be, and they find themselves intellectually and/or structurally ill-equipped for the challenge. Interesting rorschach test, isn't it ? Sorry, when I said "you may argue" I actually meant "you" in a general sense, not you specifically. "One" would have been a better choice of word. My point was many believe the PAP to be autocratic so it's hard to see a Singaporean government more autocratic than a PAP one. In fact, for the opposition to get into power in the first place, they'll have to show they're more open and democratic. But for your scenario to happen, they'll have to, at some point, do a U-turn and move the other way. This will take time, and as long as there's some form of democratic process here involving elections, it will not happen in Singapore. I don't disagree with your points about mercenaries in the Middle-East. THanks for stating them again. But I still see no substance behind you equating Gurkhas with those foreign mercenaries. They are not. They are a professional force, not a private army. A complicating factor as pointed out earlier is the presence of a British officer in its senior ranks. Anyway, my overall point is the Gurkhas here can't be spoken of as a Praetorian Guard of the Singapore government because they're not. They were not established as once, and don't enjoy the same patronage as regime-protection units in other strong-man dictatorships. Also, given their strong British heritage and sense of military professionalism, I do not foresee them being unethical or going against international law as they discharge their duties. This is a crucial difference between the Gurkhas and guns-for-hire. You also mentioned journalists not making a distinction between Gurkhas and soldiers of fortune. This is a separate issue concerning reporting and has nothing to do with how the Gurkhas will behave specifically. But it's interesting you mention the media because having a "rogue" Singaporean government fight its own people would do it unsurvivable harm. Think of the bad publicity brutal suppression of Singaporeans will bring. We ban chewing gum and cane foreigners and that's already a big deal! No regime in Singapore can survive as a pariah nation like N Korea or Libya because we import everything and have no natural resources, especially oil. If sanctions are imposed, as they have been on Gaddafi's Libya, Singapore's dead. But if it ever happens, then really, I think us Singaporeans deserve it. Because such a government would not have appeared overnight, there would have been a long gestation period, and there would have been opportunities for us to stop this dangerous slide towards extreme autocracy. That's the basis of democracy (we have to live by what we chose). That's what we so badly want, right? Having the government build in a specific check against a "bad" government seems so against democracy. It's like genetic engineering for governments. The logic is in a democracy, the people would only vote in what they think is best for them. Conversely, one can also argue that the GC are there to prevent a military coup like those which befell some of our neighbours. I think the best insurance against a military coup happening is (over)emphasis on professionalism in the military profession. Stress discipline and chain of command. Invest in across-the-board professional military education. Rotate leaders frequently to avoid the development of personality cults. Have a clear sense of mission and purpose. Keep the military out of business and politics (until they retire or leave service). Pay soldiers well, and on time. The SAF has generally done well on all accounts. No need for any preventive measures. "In a worst-case scenario, a freak election result could boot out the government of the day. If Singaporeans unwittingly vote in a rogue government, a would-be despot would find that he (or she as the case may be, since there are many bad tempered and scheming Singaporean women out there) has at his/her disposal a host of instruments to muzzle dissent." Er is there a subtext here? Do you mean -- how should I put it delicately -- the incumbent party would not/never turn rotten? Why did you speak of "freak elections"? How about the situation where the people voted in a "good" government but the out-going one fearful of loosing power turn to the hired guns for survival? It is unlikely that the opposition will sweep the majority of seats in a GE. The 2 only ways I foresee that happening is if the PAP splinters, and we have tried-and-tested politicians with the relevant experience in government in two or more parties. Still, the number of PAP cadres deserting will be small. And in the history of the PAP, we know what happened the last time this happened. Although that makes a powerful punchline, the PAP's a lot more savvy now. No need to lock them up, there are many ways to skin a cat. That's politics in the 21st century anyway. The second way is if the PAP screws it up so bad that the people get fed up and whack them real hard. This just happened in Ireland. But let's face it - the PAP did ride the economic crisis quite well. That's not to say they'll always be good, but like it or not, there are currently able people in government. So a more likely scenario is if the opposition gains a small beach head in government and incrementally tries to expand is representation. But I firmly believe that for all the polemics presented by disgruntled Singaporeans online, they're still just the minority, albeit a vocal one. All things considered, the PAP hasn't done a bad job and I think most Singaporeans, who may mumble and grumble, see value in that. More may vote opposition, but I don't think we'll see dramatic changes and the installation of a opposition majority in a single election. Opposition presence will incrementally increase over the decades, if it does. But the PAP will probably do its darnest to stop this expansion. GEs have to be called reguarly. 4-5 years is not alot of time for the opposition to shore up its base of support. It's easy for the incumbent PAP to check the opposition in the short-term. Therefore, sudden changes in the political landscape will be unlikely, and the issue of one party using force to contest electoral results which install a new dominant party in Singapore is quite far fetched. In the short to medium term at least. The conditions for that to happen just won't be there. I'm also pretty sure the PAP will never do that because they pride themselves for being sophisticated. They'd nip the problem in the bud, long before it gets that far. We see this "strategic foresight" in government policy. It's really a PAP way of doing things ... which isn't bad if you think about it. In the words of a former diplomat, the "PAP is devilishly clever." You can hate them for that, but hey, politics is dirty business! Why'd you think the anarchy movement is always evergreen. But who knows what'll happen in the longer term. But in the "long run, I'll be dead." Anonymous asked.... "But how are they classified under the LOAC? They are not illegal combatants, but neither are they actual military or police..."
Legally, Gurkhas are police officers. or maybe a finer subtext or code exists that i am simply unable to decipher, due in addition to my incompetence, perhaps also an unusual level of subtlety that could itself be the distilled outcome of a number of factors which i shall not speculate about... i am not particularly familiar with your political affiliations though - which also makes it harder to impute your original intentions. i know the PAP regime's bland but effective take on political repression isn't exactly in the same league as your muamar gaddafi or robert mugabe, but it's certainly undeniable that this country falls far short of universally recognised standards and indices of democracy, freedom and human rights. they have certainly been rather effective and successful, though one wonders if their (qualified) success at the polls is truly reflective of genuine support and affection, and not just the use of various instruments of state to muzzle, disrupt and silence dissent. the professionalism of a state's armed forces might be an important factor in determining if the said force harbours any ultimate fantasies of political interventionism, but what is even more important in clearing away the possibility of coups is really developing and entrenching a pluralistic, inclusive, egalitarian and democratic public ethos, together with robust and independent state institutions, a non-partisan and professional civil service, a mature political culture and a major role for civil society. only then can we have an enmeshed system of checks and balances that prevents power from being concentrated in the hands of a (however "well-intentioned" or capable) elite. unfortunately, civil-military relationships in democratizing states will always be fraught with a multitude of clashing ideologies, opposing interests and divergent priorities, as long as a more politically sophisticated culture rooted in shared universals like democratic values has yet to take root. i can't say that my views of the leadership capabilities and professionalism of SAF officers hasn't exactly been coloured by two and a half years of national service a couple of decades back. and while my personal assessment based on that is a particularly dim and grim one, at least i continue to believe that at (or near) the very top, the SAF does boast a cadre of professionals who can generally be counted to do their jobs and to do it well. i am not a singaporean nationalist in any way, but i believe somewhat disinterestedly and dispassionately as an observer without any major agenda that having a well-trained and well-equipped SAF does give the political leadership of this state some additional guarantees and options, and not only in security matters alone. however, i have for the larger part of my life, been highly suspicious of the institutionalised and far-reaching symbiosis between the civil service and the ruling party. this can't be healthy if this country is ever going to become a normal, thriving democracy. similarly, the deep (and not exactly open or transparent) relationship between the armed services (and other security bodies including the police and intelligence agencies) and the ruling party is also cause for concern. a good army is one that consistently rises above politics. and politics shouldn't be myopically (or intentionally) misread as the unassailability of one-party rule! the ruling party's continued courting of top SAF talent while they are still under uniform and oath would thus seem to cast doubt on the impartiality and integrity of the highest echelons of the SAF's leadership, which is lamentable, don't you think?